Jesus was still angry as he arrived at [Lazarus'] tomb, a cave with a stone rolled across its entrance. "Roll the stone aside," Jesus told them. But Martha, the dead man's sister, protested, "Lord, he has been dead for four days. The smell will be terrible." 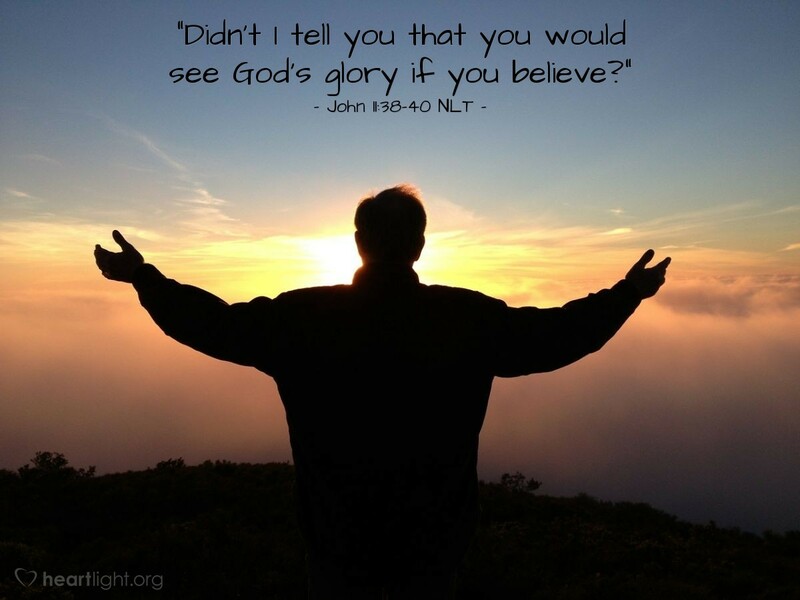 Jesus responded, "Didn't I tell you that you would see God's glory if you believe?" Gritty. The reality of Lazarus' death — the sorrow, disappointment, friendship, finality, grave, and stench — is told in plain, straightforward, and gritty truth. Lazarus is long gone. His tomb is shut. His body stinks. His sisters are disappointed by Jesus' absence and tardiness. All those close to Lazarus grieve his passing. All these realities, however, have to give way to a greater reality: Jesus and his glory! Jesus overcomes our mortal reality. At least that is what faith says. So the issue we face in the bitter realities of death when it hits close to our home is this: Do we have faith that Jesus and his glory offer us a greater reality? Holy God, please bless those that I know and love who now grieve because death has hit close to their home. Bless them with faith so they can believe in the greater reality of Jesus' return in glory. Father, I also ask for confident faith in that same greater reality. Give me courage, grace, and faith as I face my own mortality and the mortality of all those I love. In Jesus' glorious name, I pray. Amen.